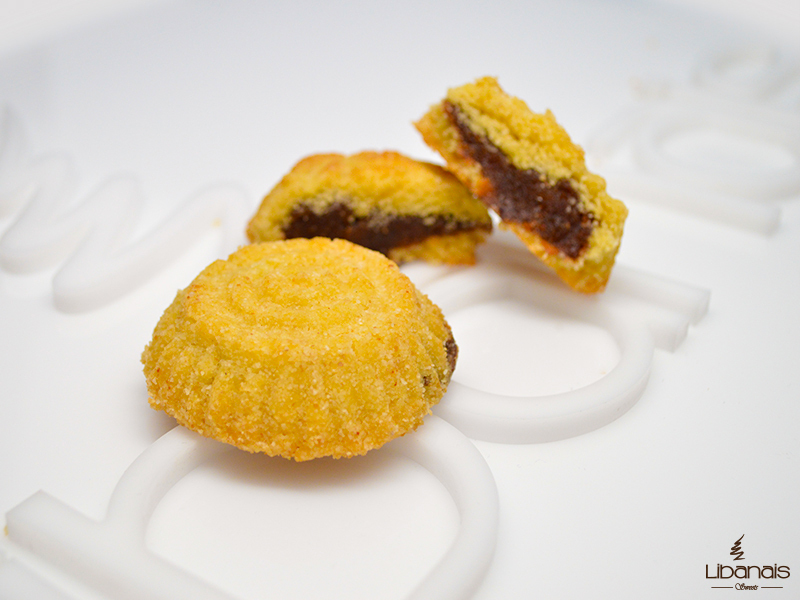 It is a delicate and sweet Middle Eastern semolina cookie filled with dates, pistachios, or walnuts. It can also be made with white flour instead of semolina. Semolina, sugar, butter ghee, rose water, orange flower water, yeast, and either dates, pistachios, or walnuts, depending on the filling chosen. Maamoul are usually formed in the shape of balls or domes and filled with dates, pistachios, or walnuts, and topped with powder sugar. It is also rarely filled with almonds or figs. In order to differentiate between the three fillings, each type is molded into a different shape. The walnuts filled version is customarily shaped in the form of a dome with a rounded top, while dates filled one takes the form of a dome with a flat top. The pistachios filled cookie, on the other hand, has a relatively elongated oval shape. pronounced [ma’-mul], it is also written Mamul, Maamul, or Ma’moul. First the semolina dough and the filling (dates, pistachios, or walnuts) are prepared. Next, the dough is cut into pieces of the desired size and filled with the filling of choice then shaped using a wooden mold and baked. The dough is made of semolina, butter ghee, yeast, rose water, and orange flower water. First, semolina and butter ghee are mixed together and left to rest for about twelve hours. Yeast, rose water, and orange flower water are then added and mixed to form the ready dough. Traditionally, Mamoul is filled with pistachios, walnuts, or dates. For pistachios or walnuts fillings, the nuts are grounded, whereas for dates filling, a date paste is used. Sugar and sugar syrup are added and mixed with the nuts or dates to form the filling paste. Small pieces of the dough are cut, the desired filling is put on the dough, and the dough is closed around the filling to form a ball of dough filled with pistachios, walnuts, or dates. The filled dough balls are then put inside a mold to take a particular shape and are left to rest for about an hour. The filled dough balls are placed on a baking sheet and baked for about eight minutes on high temperature. Maamoul is often offered with coffee or tea anytime during the day. It is most popular in Lebanon, Syria, Israel, Jordan, Palestine, the Arabic Gulf region, Egypt (where it is usually filled with Lukum), Turkey, Armenia, Iran, Greece, and Pakistan. These cookies are a must have dessert during religious holidays like Easter, Ramadan, Purim, Rosh Hashanah and Hanukkah. Maamoul is a Middle Eastern cookie. Maamoul is available for sale on our secure online store, on our Amazon store, at a grocery store near you, or in our retail stores.